These are some special papers, my friends! 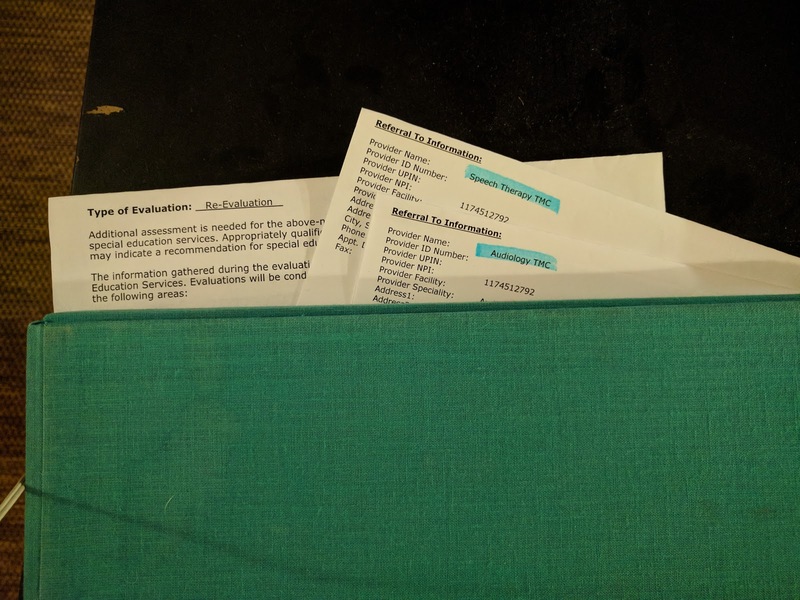 These are the evaluation order and referral requests for Fire and Earth and I couldn't be happier to finally have them in my hands. Fire has struggled with speech issues for years and although we finally saw some improvement during preschool, he never qualified for speech therapy like I hoped he would- his coping mechanisms were just too good and there were just too many other students that scored worse. After years of "wait and see", his kindergarten teacher agrees with me that he needs some extra help and Fire will be evaluated again for speech therapy. While the therapist was concerned that he would pass the tests again and she didn't want to test him into therapy, she seemed to think that he could benefit from her help. It was the first meeting I've been to for Fire that I've felt like someone was taking my concerns seriously and it was so refreshing to be believed. Earth is Fire's full biological sibling so it's not surprising that he would have some language delays as well and because we're in America he was given referrals for audiology testing and a speech evaluation at his 2-year well-child visit. Earth says just over 20 words regularly and isn't starting to make sentences yet (the norm for 2 year olds is 50 words and two-word sentences regularly). While he's not screaming like Fire used to, he has terrible tantrums and I think if Earth were able to make himself understood better, that might improve. I don't want to get too excited but these referrals make me feel so vindicated. Mamas, if you think your child needs help, keep fighting for it! You know your child best and don't let anyone else tell you that he or she is "fine" when you know they can be better than "fine" with some extra help.